Many countries conduct policies that shift tax revenue across regions in order to tackle spatial economic disparities within their territory (e.g. Acconcia et al.2015). Fiscal transfers are particularly pronounced in Germany. Using data on generated taxes and available public funds at the local level, in a new paper we estimate that a substantial overall amount of €65.7 billion was shifted across the 411 districts (Landkreise) in the year 2010 alone (Henkel et al.2018). This is equivalent to 12.4% of aggregate tax revenue and includes various grants from upper- to lower-level government layers, the horizontal fiscal equalisation scheme across Federal States (Länderfinanzausgleich), and additional lower-tier schemes that redistribute from rich to poor jurisdictions within States. The volume of fiscal transfers within Germany is, thus, more than twice as large as all EU structural funds combined. The direction of those fiscal flows is illustrated in Figure 1. The main recipients are poor and remote locations, often in East Germany, where the inflows account for up to 23% of local GDP in some cases, or €3,800 per inhabitant. The major net donors are large cities in West Germany with high productivity and wages. Frankfurt contributes 13.3% of its local GDP, or €11,000 per inhabitant, followed by Düsseldorf with €6,800. Berlin is a notable exception, because it is a net transfer recipient (of roughly 5% of local GDP) despite being Germany’s largest city. Given this strong prevalence of fiscal transfers, surprisingly little is known about their economic implications. The transfers obviously allow recipient areas to offer more public goods than they otherwise could, while the donors have fewer resources left to spend. The policy may thus deliver what it intends to achieve, namely, to reduce intranational economic disparities. However, the question is whether this involves an equity-efficiency trade-off, namely, that the higher degree of cohesion comes at the cost of lower national output overall. Ultimately, we are interested in the aggregate welfare effects of this policy, i.e. whether Germany as a whole would benefit if all fiscal transfers were switched off. From a purely theoretical point of view, there are no obvious answers to those questions. On the one hand, by shifting resources from rich to poor places, transfers may distort incentives and induce some workers or firms to locate in regions that they otherwise would not have chosen (Kline and Moretti 2014). These misallocations may be particularly severe when recipient areas have low levels of productivity, or when they are remotely located so that transport losses in interregional trade are exacerbated. The fiscal transfers may therefore reduce aggregate national income, because they divert economic activity away from core cities (Hsieh and Moretti 2017). On the other hand, the spatial economy might be affected by various externalities that individuals do not take into account when making location decisions. For instance, individuals may ignore their impact on others that is transmitted via local price index effects or through different agglomeration and congestion forces. A laissez-faire equilibrium without transfers may therefore be characterised by an inefficient spatial structure, and in particular, by cities that are ‘too large’ from a social point of view (Henderson 1974, Albouy et al.2017). By reducing over-congestion in cities, the fiscal transfers may therefore actually mitigate rather than exacerbate misallocations. To shed light on those important trade-offs, we set up and quantify a general equilibrium model with multiple asymmetric regions, costly interregional trade, and imperfect labour mobility. More specifically, we build on the recent framework by Allen and Arkolakis (2014) and extend this approach to include inter-jurisdictional fiscal transfers. We calibrate the model for Germany, taking into account taxes and net transfers across regions as observed in (or recovered from) the data. The initial situation in our model represents a spatial equilibrium, in the sense that utility is equalised across space and individuals, who are allowed to have idiosyncratic locational preferences, and have no incentives to move anymore. In a counterfactual analysis, we then simulate how this equilibrium would change if Germany were to abandon all fiscal transfers completely. In this hypothetical scenario, local public goods are financed solely by taxing local economic activity, but there are no more transfers across jurisdictions. Comparing this counterfactual to the actual equilibrium allows us to provide quantitative answers to the questions of how, and through which channels, fiscal transfers affect the spatial economy. In our counterfactual analysis, we first observe a major migration wave out of the former recipient and towards the former donor regions. Some East German cities would lose almost one quarter of their population, while big cities like Frankfurt or Munich would grow substantially. In total, we calculate that roughly 3.2 million people would change their district of residence. This number of cross-district migrants is more than thirty times larger than the actual migration that we typically observe per year. Fiscal transfers therefore seem to substantially affect people’s location choices. As the induced migration from abolishing transfers is from less to more productive regions, we observe substantial gains in aggregate output and productivity at the national level – in our benchmark specification, we calculate a gain in real GDP per capita of 3.7%. Average labour productivity would increase by 5.8%. The top panel in Figure 2 illustrates the counterfactual change in national productivity for various parameter constellations. It is consistently positive and can range up to almost 20%. 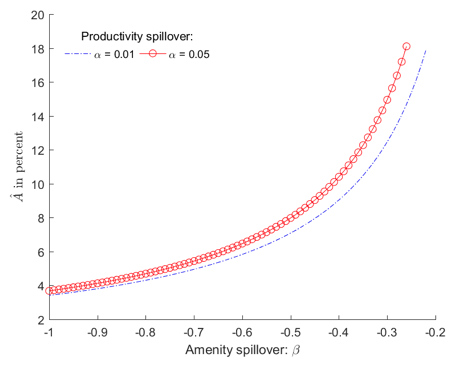 Fiscal transfers thus seem to imply an equity-efficiency trade-off – by retaining economic activity in the periphery, they limit productivity and income dispersion across space. But this comes at the cost of lower national productivity and output. When turning to national welfare, however, we find that this trade-off may actually notexist. In our baseline counterfactual, welfare even mildly decreases by 0.05% when transfers are abolished. In other parameter constellations, illustrated in the bottom panel of Figure 2, we sometimes obtain welfare losses and sometimes gains, depending on parameters. But even when there are welfare gains, they are consistently an order of magnitude smaller than the increases in national productivity and output. In other words, abolishing fiscal transfers from rich to poor regions within Germany will increase national GDP, but it may decrease welfare. What is the intuition for this surprising difference? 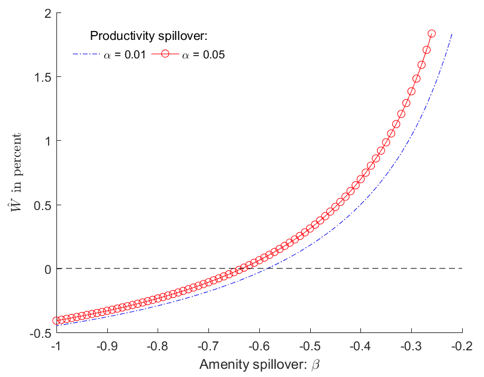 The result is rooted in inefficiencies of the initial spatial equilibrium. One important channel in our model is that the former donor regions are already ‘too large’ from a social point of view. There is a mix of positive and negative externalities in our framework that individuals ignore in their private location decisions, representing different agglomeration and congestion forces and also the sharing of local public goods. But the combined net externality that single individuals impose on others must be negative at the margin, otherwise it is difficult to rationalise why the economic geography of a country does not collapse into a single city. Hence, large cities tend to be ‘too large’, although interregional transport costs and market size effects can work against this tendency. The fiscal transfers that we observe in reality effectively countervail over-congestion, because they provide incentives for workers to reside outside the big cities. This can be welfare-enhancing, especially if transport costs for goods are not too large and if the recipient areas are not too remotely located. And vice versa, abolishing the existing transfers can be bad for welfare, despite the associated productivity gains, because it makes the problem of over-congestion in large cities even worse. The fiscal transfers are surely, at most, a second-best instrument and do not implement an ‘optimal spatial structure’ of the economy in any meaningful sense. But our results suggest that they may shift the economy closer to this optimum. One might argue that policymakers should first counteract the tendency of over-congestion, for example by removing housing supply restrictions in popular cities or through investments in urban transport systems, and then reconsider the case for redistributive fiscal transfers. But such a proposal misses the point. It is easy to imagine that urban infrastructure or construction investments are beneficial to society and easily pass standard cost-benefit assessments. But individuals will react to those changes. The spatial equilibrium will involve more people moving to the large cities. However, this does not change the logic that the net agglomeration externality is negative at the margin even in the new equilibrium. The case for transfers may thus remain unchanged even after the urban investments have taken place. Our results can potentially have important implications for spatial redistribution policies in Germany and elsewhere, in particular because they suggest that equity-efficiency trade-offs can be very different depending on the economic variable (output versus welfare) one is focusing on. Albouy, D, K Behrens, F Robert-Nicoud, and N Seegert (2017), “The optimal distribution of population across cities”, unpublished manuscript, University of Illinois. Allen, T, and C Arkolakis (2014), “Trade and the topography of the spatial economy”, Quarterly Journal of Economics 129(3): 1085-1139. Acconcia, A, G Corsetti, and S Simonelli (2015), “Consumption responds to liquidity-enhancing transfers: Micro evidence from Italian earthquakes”, VoxEU.org. Henderson, J V (1974),“The sizes and types of cities”, American Economic Review 64(4): 640–656. Henkel, M, T Seidel, and J Suedekum (2018), “Fiscal transfers in the spatial economy”, CEPR Discussion Paper 12875. Hsieh, C-T, and E Moretti (2017), “Housing constraints and spatial misallocation”, unpublished manuscript, University of California, Berkeley. Kline, P, and E Moretti (2014), “Local economic development, agglomeration economies and the big push: 100 years of evidence from the Tennessee Valley Authority”, Quarterly Journal of Economics 129(1): 275-331.